Protect your most important possessions with all the strength and stability of the earth. 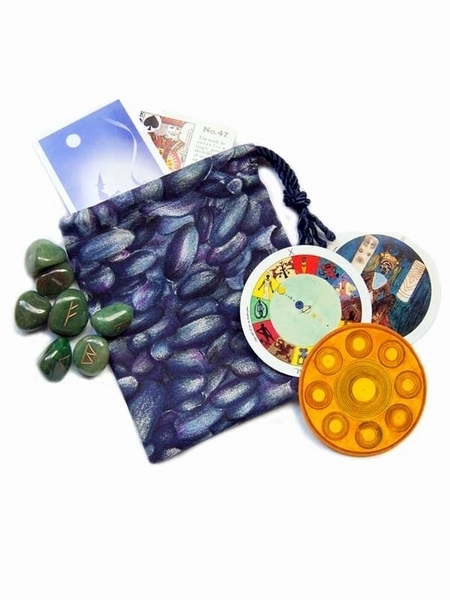 Covered with small, smooth stones this pouch is perfect for storing and transporting your set of runes, your gemstone collection, small or pocket size divination cards, or anything else that will fit within. The blue, blue-grey, and indigo touched river stones on this bag evoke images from many northern European myths � cold, rocky beaches � massive, ancient stones with bold runes carved into them � dense, foggy forests and icy landscapes. In other words, the environment and setting of the medieval Eddas and the Icelandic Sagas. But you don't have to read runes to connect with this bag. If you're drawn to earth energies and cooling colors then this bag is for you. Pictured: Saga rune pouch with aventurine runes, and cards from the Gypsy Witch Fortunetelling Deck (top) and the Mini Motherpeace Round Tarot deck (right) - runes and cards not included. Design: Our single draw bags are a no-fuss, streamlined option for keeping your cards or runes protected. All seams are quadruple stitched and the drawstring opening is reinforced. See our Quality page for more details about construction. Size: Measures approximately 5" wide by 6" inches tall (12.7 x 15.3 cm). Fits most rune sets and small card decks (2.75" x 4" and smaller).